Comprehensive Provider: Alarm.com is an all-in-one technology provider: home security, home automation, video monitoring, etc. There is no need to bundle with multiple companies to fully protect and automate your home. 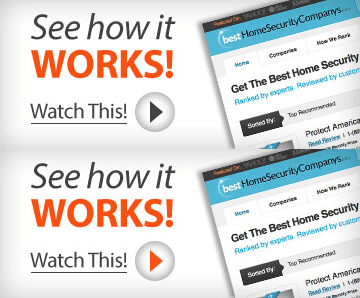 Smart Technology: Alarm.com features award-winning technology. They were the first security technology company to provide a smartwatch app that works hand-in-hand with their security/home automation system. With Alarm.com’s technology, you can manage your system remotely from your smartphone, smartwatch, or a computer. This technology includes setting the thermostat, locking the front door, viewing camera feeds, or making sure the lights are turned off. You are also able to set up custom notifications, so you know when the kids get home from school or if a package has arrived on the front porch. Mobile Connection: Alarm.com runs on a cloud-based cellular system. Cellular systems can be advantageous because they do not require a landline to function; however, for areas that have weak or limited mobile connections, i.e., many rural areas, the security, and home automation systems may cease to work if it loses the cellular signal. Inconsistent Pricing: Alarm.com leaves pricing options up to their local/regional partners. With no transparency in pricing, it can be difficult to shop within the desired budget range without requesting customized quotes/bids. Our Recommendation: Despite offering customized options for alarm and smart home automation, there is somewhat limited transparency in terms of what Alarm.com offers. For consumers looking for a complete home security provider, Protect America and Frontpoint are reliable options. Do not do business with this company! They contract their work out and seem to not care how their contractors handle business. Twice I’ve had connection problems and could not receive a call back for two months, so now I have a new router and have done what the app ask to do to connect new router no luck and again their contractor has left me hanging going on 3 months, do not do business with Total Connect in Modesto CA., and I get no help from Alarm.com they listen to my complaint then nicely say they have nothing they can do it’s the contract company that I cannot get in contact with that I need to talk with. I have owned a few Alarm.com system and related products for about 6 months now. I have had two devices fail and the system requires constant troubleshooting. This thing is not worth the price nor the time to keep working. Won’t help at all. Told them my home has been without security and they haven’t responded. It’s been over 10 days. Don’t buy this. Get simplisafe instead. They expect you to read the fine print as your are locked in for 3 years! They don’t tell you that at all. It’s seriously insane. This has to be the worst company I have ever had the displeasure of dealing with. From customer service to the actual installation. Every time I call, they reroute me to another department and it wasn’t until this last time I called when I had the initial person who answers stay on the phone with me until they “resolved the issue,” which in the end never was resolved anyhow even now 30 days after the call. It has been an ongoing issue for almost a year. They claim that they only have one expert on the West Coast to help with installation. They also have sent the expert who doesn’t complete the work and lies about the work that has been completed in his work orders. I am so fed up and I actively shopping for another company so when my contract ends in April I will lose them. I am fed up with them and their customer service and overall product. Have outdoor cameras that record periodically. It will record a snowflake but it wont record a human walking in the yard. I’ve had 5 different tech support agents and one tech on site and they still cant figure out the problem. They said I can pay another $85 to bring another tech out and $60 for each additional hour. Camera are under warranty by the manufacturer but that cant give me new cameras unless another tech says they are malfunctioning. The other solution I got was that they can send me new different brands of cameras but they will have to extend my contract by 19 months. If I want to cancel then I would have to pay thousands to get out of the contract. Whatt a crock of you know what. This is the worst company ever. Better off going with another company. 100% dissatisfied!!!!! I ordered a video doorbell through my alarm company, Brinks. The installation was through a contractor working with Brinks. However, he contacted ALarm.com for service. Before installation I contacted the contractor with some questions one of them was if the doorbell was 720 or 1080. I was told 1080. Great. After installation and checking the box I find it’s an obsolete 720. I’ve had the doorbell one week and no one will cancel this out of date doorbell. I am very upset. I have been with Moni/Brinks for years. I will be looking for a new company. Alarm.com controller functionality is very slow for automation, very limited in feature flexibility, planning on buying a new Z-Wave controller to handle the automation features for everything except alarm. Sad but true. Example, have a scene created to turn off all indoor lights… it take close to 30 seconds and more to turn off the lights after button pushed. I want a trigger for locking the door based upon exiting the geofence… not even possible. Vera Lite is much more flexible and actually responsive to feature requests… Alarm.com is completely non-responsive. For the cost I’m paying… it could be considered theft. I have had alarm.com equipment for a few weeks now and overall enjoy but haven’t had to utilize it much on the security cameras front, however, I will say that the fact that you can’t clear up space on false movements that count towards your 1000 recordings a month is a terrible feature. My system was installed by 5pm one day, by 5am the next day I was told my 1000 clip limit was up for the month? Now I don’t get notifications if something is actually going on for the rest of the month. Haven’t had to use the storage recorder yet to know how easy or difficult it is to use. I have an outdoor camera. A spider got on the camera and it recorded all night long. I got an e-mail that all of my recording time was used this month, even though I went to the website and deleted all the video recordings. I was advised the camera will start recording next month or I can pay more money and purchase more recording time this month. Seems pretty pathetic to me. I would not recommend an outdoor camera from alarm.com to anyone…run the other way. Their customer service is nonexistent. This rating is on the wireless cameras. No reflection on the service tech. The service tech has been super nice. Don’t waste your money on the wireless cameras. Junk! Junk! Junk! They don’t stay connected. They have to be rebooted often. Then I purchased a $200 router. I’ve had service a rep here twice. The second time after the camera warranties ran out at $85.00+ per call. They rebooted and reconnected the cameras. Again only after a few days….not working! Buy RING products at Home Depot. Easy to install. 100% trouble free!! I have 3 RING cameras and am replacing these 2 Alarm.com pieces of scrap next! Thank you for the follow up. We appreciate you passing along the numbers used in this call so that we can investigate your call. We are very sorry, again, for what you experienced. While receiving feedback like this is never easy, it is the only way a company like ours can learn and grow. We take this very seriously and will seek to improve based on what we learn from this situation. We would like to thank you once again for taking the time to report this. If you have additional feed back or questions for us, please let us know. Just to let you know. I did call Brinks, Links, and etc. All of them told me the same things. Alarm.com has Customer Service issues and some said, “It has been ongoing for years”. In the end, it is only a warning. Get burned, but at least I tried to reach out to Alarm.com and now I am reaching out to the community. After a couple false positive we are afraid to use the unit. Called to cancel and was told there would be a $2000.00 buy at fee and I was stuck with another 3 years 10 months. Serviceman took over an hour to figure out how to get on my wifi and they actually charged me for the sevice. The alarm stay mode now is worse as it make loud beep noise for 2 minutes. Not going to use that feature anymore. $45.00 a month for this garbage!! Buyer beware. We have had an ADT for over 8 years and wanted to upgrade. What a HUGE mistake that was. They came in replaced what they had to left the rest of the gear old panel on wall battery but rook all the rest. Within the first 3 hours of tech leaving our sump pump kept going off contacted ADT for some sort support HAHA what another joke kept getting put through to another person. Called tech support which don’t exists. Had another tech come out and replace the new sensor with another new sensor he left and an hour later samething started happening. By this time I’ve already had enough called back again got put through to more people that could not fix the issue.now battery is totally dead on panel and it won’t do anything not even 24 hrs old what a joke. Next time the Competition comes knocking they will get my service. The system does not work as sold! Customer Service Manager does not return calls as he says he will. They will try to lock you into a long term contract…do not get suckered into signing the contract. I have had to add two routers to the system and the system still does not work. The cameras do not work properly, there are long delays in the alarms even connecting when you try to view your home. The system is supposed to disarm itself once you pull up in the driveway of your home and it does not work.. It does not even turn the alarm off when you walk in the door. Feature is totally useless. Find another company to secure your home with as all you will get from AMP SMART, ALARM.COM is a bunch of false promises.